Stoke-on-Trent in the early 1950s: the pot banks threw out smoke and the horizon, if you could see it, was lined with the unmistakable shapes of red brick bottle kilns. When the November smog descended, unlucky housewives or daughters who’d hung out clean washing would find it blackened. Workers in the Potteries couldn’t expect to live far beyond 50. This is the background to Deborah McAndrew’s gripping Dirty Laundry, which sets the titular drama of domestic secrets in the specific context of a city and its filth-producing industry on the brink of the Clean Air Act, with its promise of both environmental progress and economic uncertainty. That the play is performed in the half-derelict Spode works brings about interesting tensions, turning a post-industrial graveyard into a living space that celebrates, commemorates and reawakens civic pride in the ceramic industry and its lost communities. 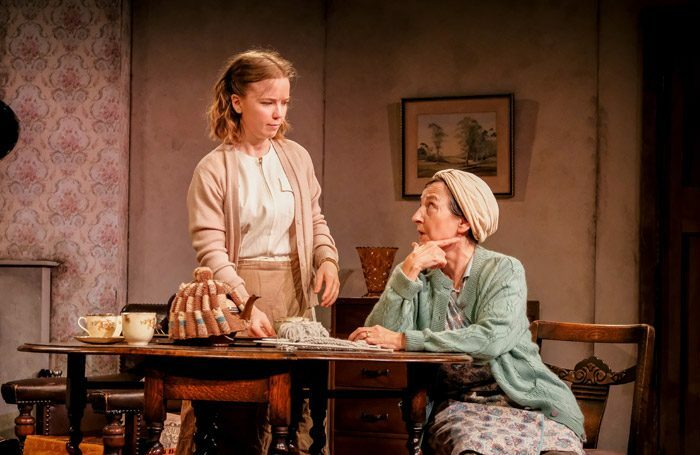 The warehouse draught brings an effectively realist chill to the Moth family’s 1953 Burslem terrace, with its soot-stained wallpaper, mahogany-mounted wireless and tin bathtub. The five-strong cast are uniformly excellent, all of them delivering with aplomb the Stokie intonations at which so many actors fail. It’s a singularly elastic accent with traces of Brummie, Scouse and Manc, and for a local audience it’s a delight to hear words like “werritting” pronounced correctly. McAndrew’s skilful writing keeps the mystery taut and the production’s only clumsy moments occur in the initial attempt at outdoors immersive theatre, resulting in much audience bewilderment and frustrated shuffling. Otherwise, it’s spot-on.